Cisco 7911G IP Phone (CP-7911, CP-7911G) fills the communication needs of cubicle, retail, classroom, or manufacturing workers or anyone who conducts low to moderate telephone traffic. 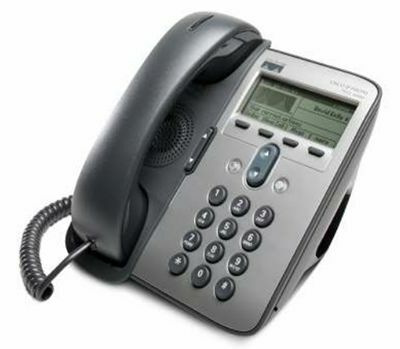 Cisco 7911G Unified IP Phone has four dynamic soft keys to guide users through core business features and functions, while a pixel-based display combines intuitive features, calling information, and extensible Markup Language (XML) services into a rich user experience. The Cisco Unified IP Phone 7911G offers numerous important security features plus the choice of IEEE 802.3af Power over Ethernet (PoE), Cisco inline power, or local power through an optional power adaptor. The Cisco 7911G IP Phone is designed to grow with your organization. A dynamic, soft key-activated feature set enables the phone to keep pace with your requirements through regular software upgrades. Moves, adds, and changes are easy; users can simply pick up their phones and move to a new location anywhere on the network. The Cisco Unified IP Phone 7911G also provides accessibility features to those with special needs.